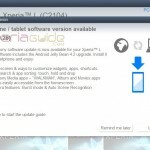 We reported back on 1st Sept, that 10.3.1.A.2.67 firmware update will be coming on Xperia Z soon and here it comes. 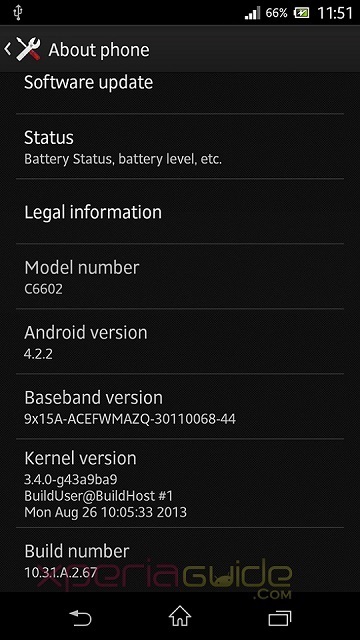 After Xperia ZR and Xperia ZL got an update with build number 10.3.1.A.2.67 firmware, Xperia Z has also been hit with same 10.3.1.A.2.67 firmware. 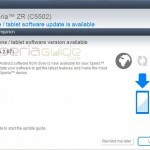 Now only Xperia Tablet Z is left which will also be updated with same 10.3.1.A.2.67 firmware very soon as mentioned by Sony Mobile’s tweet. 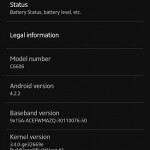 10.3.1.A.2.67 firmware keeps Xperia Z on Android 4.2.2 only and is simply a minor bug fixing update only being confirmed in Morocco only till now as per checked by an user from EMMA software. Available over PCC / SUS and Bridge. 10.3.1.A.2.67 firmware is in seeding stage now, shortly all regions will receive it. 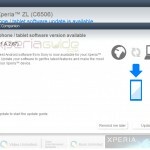 Xperia Z 10.3.1.A.2.67 firmware currently confirmed hitting Xperia Z C6602 HSPA+ versions only. We have not seen any C6603 user stating that firmware update. If you haven’t got the 10.3.1.A.2.67 firmware update yet, then you can flash manually the ftf on your Xperia Z, just like we did. NOTE :- C6603 is not seen with this update yet, as soon as it comes will update the ftf links. If you want to flash the above file you can and to access the 4G/LTE services, do this > Dial *#*#4636#*#* > Phone Info > LTE/GSM/CDMA auto (PRL) – via DooMLoRD suggestion. 10.3.1.A.2.67 firmware brings only some minor bug fixing but as per Sony Mobile tweet this 10.3.1.A.2.67 firmware update brings display, camera, battery fixes & performance tweaks. If you have already got this 10.3.1.A.2.67 firmware, let us know if you noticed any changes. 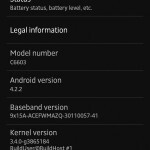 Drop your comments also mentioning the region of 10.3.1.A.2.67 firmware update. Is it worth updating to .67 or shall i wait for 4.3? I have a C6603 model and today 7.oct.2013 i’ve received the update. I live in Romania. I have sony xperia z C6603 and it has a 10.31.A.2.67 update.. Am I going to update it or not?